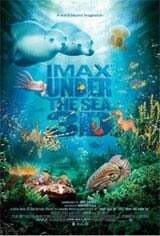 Under the Sea 3D, a new IMAX® 3D adventure, tranports moviegoers to some of the most exotic and isolated undersea locations on Earth, including Southern Australia, New Guinea and others in the Indo-Pacific region, allowing them to experience face-to-face encounters with some of the most mysterious and stunning creatures of the sea. It offers a uniquely inspirational and entertaining way to explore the beauty and natural wonders of the oceans, as well as the impact of global climate change. In IMAX 3D, the images will literally leap off the screen and float around the theatre, putting the audience in the movie.